Money- Local currency is the Florin however the USD is widely accepted. Language- You will survive on English. It is commonly spoken around the country even though Papiamento is the native language. Spanish and Dutch are also pretty common. Customs- Coming = Short. Going = Long. Give yourself time to get through customs since you are going through both Aruban and American customs. No long lines, just a lot to do. There are 2 security checkpoints, forms to fill out, and lot of walking from one place to another. Transportation- A hilarious experience. There are both standard buses and regular vans with a sign taped to the window that says “BUS”. The cost is~2.10 florin. The vans tend to be cheaper and also more entertaining as you sit and wonder just how the driver is going to fit more people inside. Seats appear from nowhere and people sit anywhere. Downtown Oranjestad has a new trolley system that will take people from the cruise ship port through the shopping district. Watersports like scuba diving, snorkeling, kitesurfing and jet skiing. It’s an island so water activities like jet skis, tubing and banana boats are available along the beach. Sailing companies are also located along the beach that will take you out to dive and snorkel sites of shipwrecks, beautiful coral and a rainbow of colorful fish. For dinner, take a cruise out for Aruban cuisine of fresh seafood while watching the sunset. Casinos are everywhere. Most major hotels have casinos to keep guests happy and busy at night. Table minimums aren’t high so you can have a good time and not lose all your money. I walked away a winner of $.10 (you read it right) one night and $60 the next. Beaches- My favorite place. I went and played on the beaches so much that I left with a beautiful bronze glow (Yay Bronzie!) that lasted for weeks. The most popular beaches are Palm Beach, Eagle Beach, Manchebo Beach and Druif Beach. Good to Know- Aruba hotels are divided into the high rise resorts, low rise resorts and Oranjestad areas. My friend and I stayed in the high rise area which has a shopping plaza with sandwich shops, coffee shops, ice cream and other local and American restaurants. First Impression- It’s hot and I can’t wait to get in the water. happy place is floating in water and this was 4 hours of snorkeling, food, drinks (alcohol included) and Carribean music. We went to several popular dive and snorkel sites where we got up close and personal with beautiful fish. The guide guys were full of personality and showed me a great place to take pictures of starfish that I wouldn’t have otherwise seen. They even let us Snuba! Most Beautiful Place – Alto Vista Chapel. It’s so little and cherished. A man was there singing and it just made the place and moment all the more special. 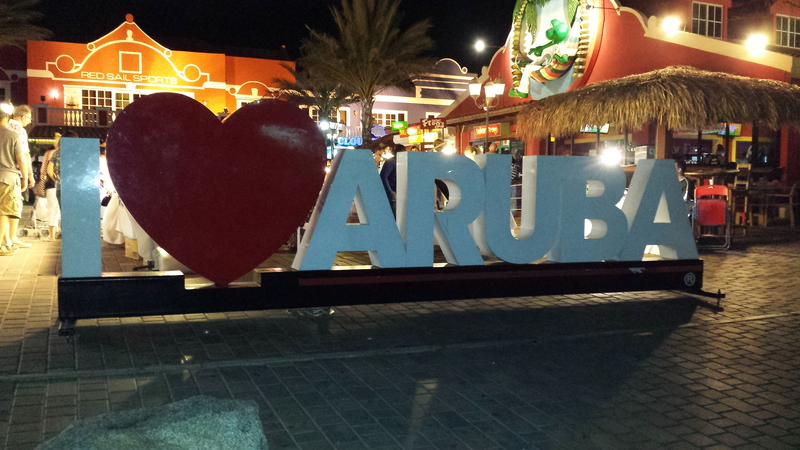 Unexpected Surprise – Aruba is mostly desert. Cacti are everywhere. Those and the beloved divi divi trees! Special Appreciation: Brickell Bay Beach Resort and Spa– I loved this place. Although it is not beachfront, beach access is a 5 minute walk across the street and down a driveway. Brickell Bay is a nice clean, non-chain hotel that has incredible customer service. These people know how to make you feel special on your birthday! During check-in, I told the front desk that my birthday would be the following day. Most hotels would tell you a casual “Happy Birthday” and let that be the end of it. Not Brickell Bay! When my friend and I went down for our complimentary breakfast the next morning, then entire front desk wished me happy birthday. Later in the day, the manager gave me a big hug and with birthday wishes and promised a surprise would be sent to my room. Even the maids knew it was my birthday. When we got back to the room from the beach, a bottle of chilled champagne was waiting on the dresser with a handwritten note. WOW!!! Posted in Bronzie Breakdowns, North AmericaTagged Aruba, Photography, Tips, TravelBookmark the permalink.